Just in time for the Easter Bunny, here is a set of 60 clips of jelly beans. 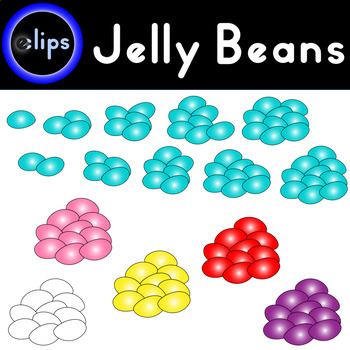 You get high-resolution PNG graphics of jelly bean clusters of 1-10 in each of these classroom-friendly colors: purple, yellow, red, turquoise, pink, and white (your students can color their own). You can use these simply for decorations for your resources and homework sheets and take home notes. Or you can create your own math resource: (3 jelly beans) + (1 jelly bean) = ? for example. Enjoy! I cannot guarantee this won't make you reach for a bag of jelly beans, but I can promise you will love the introductory bargain price. All my clipart is available for personal use (no attribution required) or commercial use (link to store required).